. Dr Tracy Lord, D.V.M. had the opportunity to treat sea turtles in a rescue centre that had mobility problems. About a year ago the dedicated folks at the Marine Stranding and Rescue Center in Virginia Beach, VA brought two sea turtles in to a clinic where I was working for evaluation and possible acupuncture treatments. Both turtles had problems with mobility. There was a small green sea turtle named Frosty who was about the size of a dinner plate and a large loggerhead sea turtle who weighed upwards of two hundred pounds. His name was Atlantis. We decided to give it a try as other therapies were not improving the turtles’ conditions. 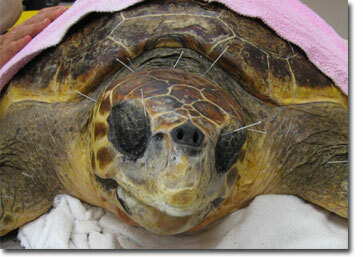 Amazingly, we found references to a few acupuncture points in turtles.. Previous Previous post: Canine Spinal Chord Injuries – Is Chondroitinase The New Magic Treatment?